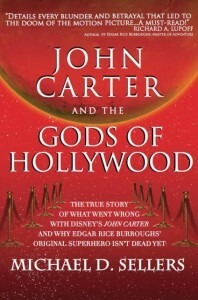 Actually, John Carter and the Gods of Hollywood will be free in the Kindle edition until February 7 at midnight (PST). It took 100 years to bring Edgar Rice Burroughs’ John Carter of Mars to the big screen. It took Disney Studios just ten days to declare the film a flop, withdraw it from distribution, and lock it away in the Disney vaults. How did this project, despite its quarter-billion dollar budget, the brilliance of director Andrew Stanton, and the creative talents of legendary Pixar Studios, become a calamity of historic proportions? Michael Sellers, a filmmaker and Hollywood insider himself, saw the disaster approaching and fought to save the project – but without success. In John Carter and the Gods of Hollywood, Sellers details every blunder and betrayal that led to the doom of the motion picture – and that left countless Hollywood careers in the wreckage. 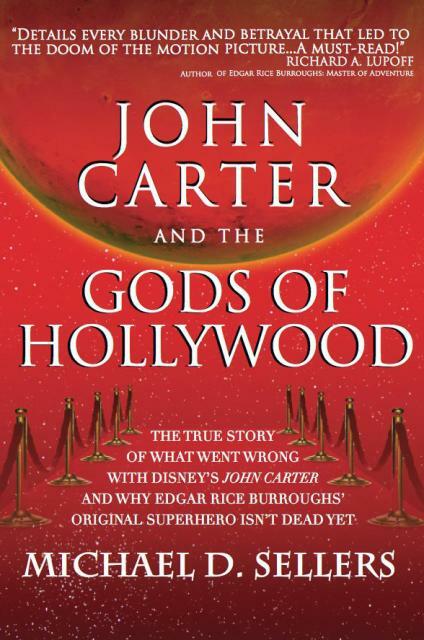 John Carter and the Gods of Hollywood is a must-read for every fan of John Carter and Edgar Rice Burroughs, and every film buff intrigued by the “inside baseball” aspects of modern Hollywood. This entry was posted in Like Show Business and tagged Edgar Rice Burroughs, Richard Lupoff by Mike Glyer. Bookmark the permalink. I saw some of Bob Clampett’s animation efforts for his early take on UNDER THE MOONS OF MARS, as an extra on a BEANY AND CECIL dvd. They were impressive, but he couldn’t convince anyone to back up his preliminary efforts. UTube has some of the clips. I don’t have linkiage ability..
I’m reminded of the tale of the guy who delivered sanitary appliances in a one-thoat wagon around the great city of Helium: the Real John Carter of Mars. Maybe it was just a story that had dated itself decades ago, and shouldn’t have been made? Y’think? it failed because Deja Thoris had way too many clothes on. If she were more authentically attired, wouldve sold more tickets. Also, title the film “War Lord of Mars” would’ve helped. Thanks for posting this, and thanks to Sellers (or whoever else was responsible) for making the book available free. It’s certainly worth a read for those interested in how films are marketed nowadays. Yes, I started reading it this morning and it’s been good so far. I read it in — *GHASP* — dead-tree edition! Enjoyed it immensely and was glad to get the Kindle version. Alas, it is up against CHICKS DIG COMICS for the Best Related Work Hugo, so has no chance whatsoever. ..if anyone has ever heard John Varley speak about MILLENIUM, you know that nothing kills a good story like too many people involved. Varley’s film had at least 23 producers involved ( I counted) and too many requirements had to be met. Nominations for the Hugo close on March 10, 2013, 11:59 p.m. EDT so no one knows if it even made the final ballot. I took Joe’s comment to be sarcastic, but unlike me he’s probably already read “Chicks” so it’s also possible he thinks it’s such a fine book it can’t be beat. I’ve started it. So far I’ve learned far more than I ever really wanted to know about Edgar Rice Burroughs. For some reason, I never found time to read any of his books. (Yeah, I know. Heretic!). I can tell that this is a labor of love and respect the author’s passion and dedication to research. So I will slog on.